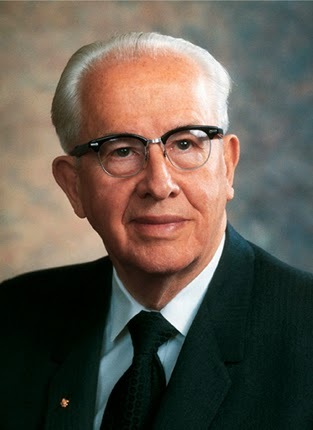 "The fundamental principle of our religion is faith in the Lord Jesus Christ. Why is it expedient that we center our confidence, our hope, and our trust in one solitary figure? Why is faith in Him so necessary to peace of mind in this life and hope in the world to come? "Our answers to these questions determine whether we face the future with courage, hope, and optimism or with apprehension, anxiety, and pessimism. "My message and testimony is this: Only Jesus Christ is uniquely qualified to provide that hope, that confidence, and that strength we need to overcome the world and rise above our human failings. To do so, we must place our faith in Him and live by His laws and teachings." 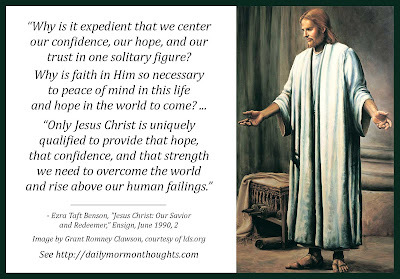 President Benson asks a vital question: why is faith in Jesus Christ so important to us in this life, and in the life to come? The answer to that question, he says, influences how we view and approach our life and the challenges that arise. It's the difference between "courage, hope, and optimism" and "apprehension, anxiety, and pessimism." Quite a contrast! So that's the answer to the question: Jesus alone can provide us with the hope and strength that life demands. We must learn to draw on His strength through faith in Him.